How does the DIVElink Wi-Fi SD Card work? Insert your DIVElink Wi-Fi SD Card into your camera. You may need to reformat it in the settings section of your camera. Make sure the camera’s time and date settings are the same as those on your phone. 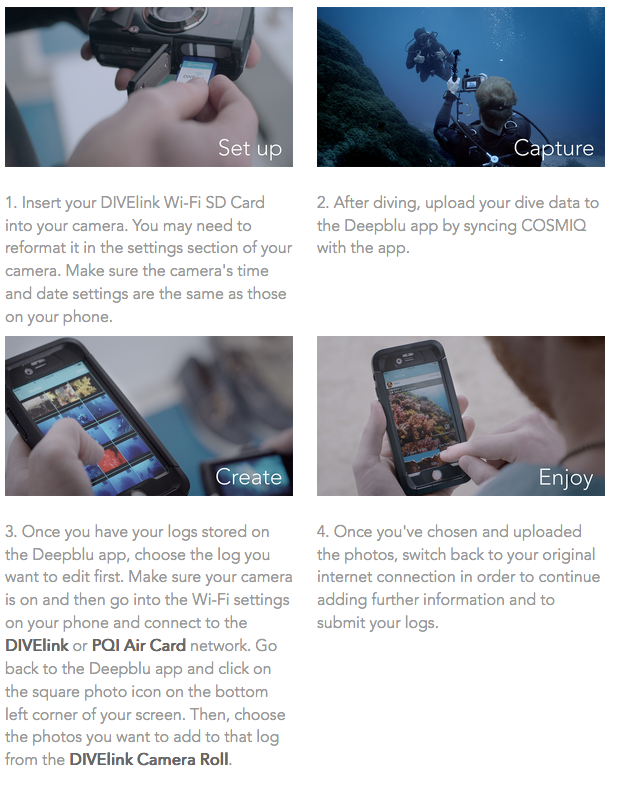 After diving, upload your dive data to the Deepblu app by syncing your COSMIQ with the app. Once you have your logs stored on the Deepblu app, choose the log you want to edit first. Make sure your camera is on and then go into the Wi-Fi settings on your phone and connect to the DIVElink or PQI Air Card network. Go back to the Deepblu app and click on the square photo icon on the bottom left corner of your screen. Then, choose the photos you want to add to that log from the DIVElink Camera Roll. Once you’ve chosen and uploaded the photos, switch back to your original internet connection to continue adding further information and to submit your logs.